D. erythrina is widespread in much of the south of Britain but practically absent in the north. It is widespread in western and central Europe, but absent from Scandinavia. This species occurs in maritime habitats where it may be the dominant member of the genus. It is frequent on heathland, to the exclusion of D. crocata and is more often associated with ants (P. Merrett, pers. comm.). It has been recorded from permanent grasslands, disused railway tracks and ancient woodlands (Crocker & Dawes 1996), from under stones, logs and debris and possibly sometimes in damp gardens. It is very rare in Essex where it only occurs in old and undisturbed habitats (P.R. Harvey, pers. comm.). The species is usually replaced by D. crocata in disturbed habitats (Cooke 1965, 1968). 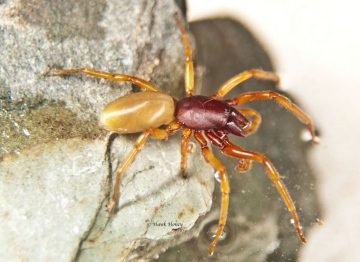 Like D. crocata it specialises in eating woodlice, rejected by most other spiders. Adults have been recorded all year round with peaks in late spring/early summer and autumn. This species is generally very local but may be abundant where it does occur.